One of the defining aspects of DGM Ghana is its tiered training structure. The project has a goal of engaging with 11,000 community representatives to raise awareness of the DGM and its objectives. Of this group, 1,100 are expected to complete basic training on climate change and sustainable forest management, with a smaller subset going on to more advanced trainings and exchange opportunities. DGM Ghana funds subprojects through three windows, one each for communities, individuals who have completed basic training, and community-based organizations. Example subprojects could include increasing biomass to improve soil fertility, supporting sustainable livelihoods, climate-proofing agricultural investments, and water conservation. DGM Ghana focuses much of its effort in communications to reach remote communities in the project’s implementation area. 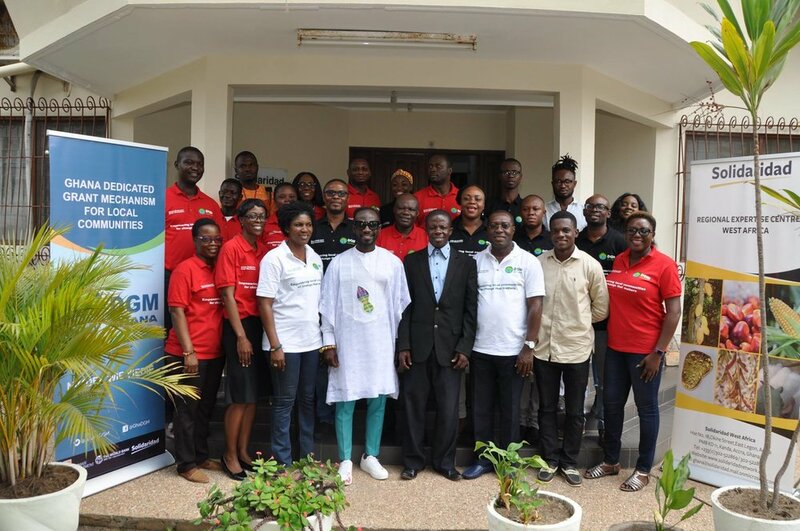 Special initiatives have included the development of a radio program, a newsletter, and a partnership with Ghanaian rapper Okyeame Kwame, who has helped raise the DGM’s profile in the country and led a rap/poetry contest to promote sustainable natural resource management. The winner (above) will be featured on the artist’s next album. On February 24 and 25, the first meeting of the National Steering Committee of the DGM was held in the city of Accra, Ghana. Thirteen representatives from local communities of the Brong-Ahafo (BA) and Western regions along the border with Ivory Coast, (the area of intervention of the DGM Ghana), were introduced as members of the National Steering Committee (NSC).